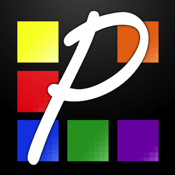 Paintrix Live is a game where the goal is to repaint an image you see on a screen. Repainting can be done by scanning QR codes that lies on the ground in a grid. The game can be played against another team and the team that repainted the image the fastest, wins. This app makes it possible to scan the images on the ground. The app will also keep track of the played games and for every game you can see statistics. There's also a level editor built in so you can submit your own levels!